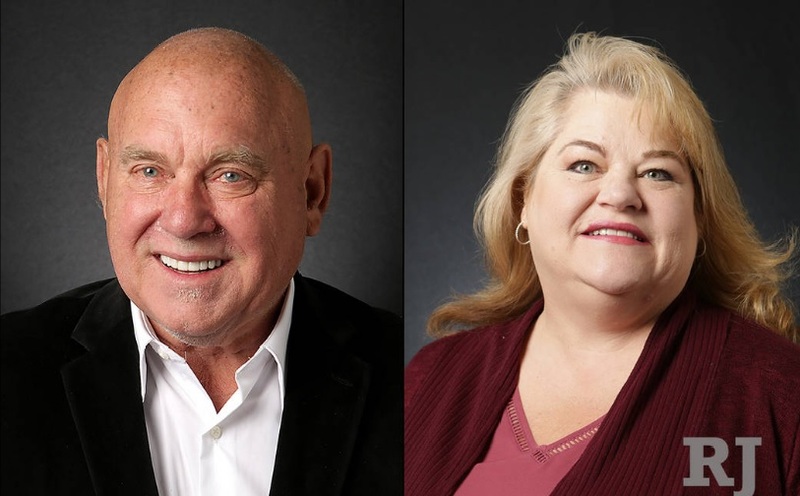 (Meghin Delaney / Las Vegas Review-Journal) – Republican brothel owner Dennis Hof is already envisioning higher political office for himself, as he expects an easy victory over Democrat Lesia Romanov for the Assembly District 36 seat. “I’m just assuming the role now; I’ve taken on the responsibility,” he told the Review-Journal. Hof said he’s looking ahead to a run for governor or lieutenant governor in 2022. Not so fast, Romanov said. The 52-year-old assistant principal she said she thinks the negative publicity that Hof has brought to the district — sexual assault allegations and issues with his brothel licenses — will propel her into office. The district’s voter registration swings heavily in the favor of the self-proclaimed “Trump of Pahrump,” who defeated incumbent James Oscarson in the primary. Romanov is the first Democrat to run in the district, where Republicans outnumber Democrats by an almost 2-to-1 margin, since 2012. Both Hof and Romanov said they’re concerned about keeping water rights secured for residents of the district, which includes parts of Clark, Nye and Lincoln counties. But that may be where their similarities end. On education, Romanov says her firsthand knowledge of the school system will help her work with lawmakers so laws that govern schools don’t have hidden consequences. She said one of her initial reasons for running came out of the discussion about teachers carrying weapons on campus in the aftermath of the mass shooting at a high school in Parkland, Florida. “Teachers don’t need that added responsibility; they need to be teaching students, and my job as an administrator is to make sure the building is safe and that my teachers and students and staff are safe,” Romanov said. Hof said Romanov has failed to make any meaningful change in the education system and that as a businessman, he’s better suited to be on the lookout for inefficiencies in school districts. Hof also criticized Romanov as just another Las Vegan who won’t represent the concerns of those in rural Nevada. He says there’s enough Las Vegas representation in the Legislature. “Even people that don’t like me because I’m in the prostitution business are not going to vote for somebody that’s from Las Vegas,” he said. Romanov said Hof wouldn’t be able to work well with lawmakers because of his brash nature and history with women. Romanov noted the large number of female lawmakers already serving and that Nevada has a chance to create a majority-female Legislature this year. “The idea of him being up there is completely inconceivable. These women would be dealing with him and he does not understand how to treat educated women,” she said. Romanov’s campaign has received support from national groups, like EMILY’S List, that support female candidates. She said she also has received backing from people involved in the #MeToo movement, supporting her as Hof has faced multiple allegations he sexually assaulted women who worked for him in his brothels. But Romanov’s support is a far cry from some of the powerhouse support Hof’s campaign is getting. Hof is holding a birthday party at The Nugget in Pahrump, where Joe Arpaio — the former sheriff of Maricopa County, Arizona, who was convicted of criminal contempt of court for ignoring a court order in a racial profiling case and then pardoned by President Donald Trump — will speak alongside Grover Norquist, the founder and president of Americans for Tax Reform. This article was originally published in the Las Vegas Review-Journal on September 29, 2018. Click here to access original article.